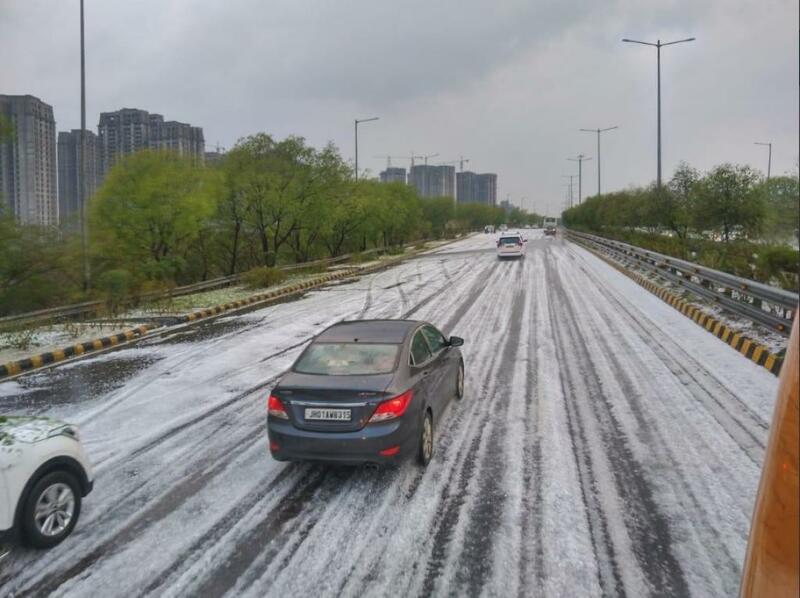 While the recent hailstorm in Uttar Pradesh’s Noida caught eyeballs as a thick layer of hail covered roads and made it look like a snowy town, but hailstorms actually do more harm than good. Not unlike other extreme weather events, farmers are usually at the receiving end of hailstorms as every year they destroy vast areas of standing crops. Gajendra Singh Shekhawat, Union minister for agriculture and farmers’ welfare, told Parliament in March last year that hailstorms had damaged 0.476 million hectares of crops in February 2018 alone. Even the unusual dust/thunder storms, which brought devastation to 16 states and killed more than 500 people, carried hail with them. Much of the damage, especially to plants and animals, was due to these icy stones. Why do severe and localised hailstorms occur and what are the underlying processes? Hail is produced in strong convective storms with long-lasting deep clouds that have large amounts of moisture and intense currents of rising air. Hailstorms over India are usually a summer phenomenon or limited to mountainous regions. This is because strong convective storms form when the air is lifted by multiple mechanisms including higher temperatures (in summer), mechanical rising (over mountains). The lifting of air (convection) causes unstable air, which is one of the main factors leading to the formation of a storm. Convective storms allow for hailstones to grow as the hailstones repeatedly rise and fall within the cloud by moving between regions of rising and falling air. Once the hailstones grow sufficiently big, their weight overcomes the force of the rising air and they fall out of the cloud. Are hailstorms mostly caused by western disturbances? Or, are other factors also involved in their formation? Hailstorms are not specifically caused by western disturbances (WD), but rather by sufficiently intense convection, as mentioned above. Winter hailstorms are a rare phenomenon as the winter season is usually too cold for hail forming strong convection. However, in one of our studies we showed that during winter season, WD can sufficiently enhance the convection to initiate hail formation. Are there any previous examples of severe localised hailstorm activity from India? There are many examples of hailstorm activity over India. There has even been a case of hailstones weighing up to 2-3 kilogrammes reported on February 16, 1988, in Puri and Sambalpur regions. In our study, we have listed all the reported hailstorm events over Delhi. Can such events be predicted by current weather models? Current weather models can predict the strong convective storms over India but most models may not be able to predict the exact location of localised hail precipitation. Although, in our studies we were able to predict localised hailstorm events over Delhi using very high resolution weather modelling and specific physics options. We require further research to predict hail on a day-to-day operational basis over India. Focus of the research could be on tailoring the weather forecast models to perform better over the Indian region by upgrading the model resolution and using correct combination of physics in the model. How will global warming affect the occurrence of intense hailstorms in the near future? Global warming leads to warmer atmosphere, which can hold higher amounts of moisture. Increased quantities of moisture in the air in a warmer future can lead to heavier rain or hail precipitation during an individual storm. Some studies have found a correlation between frequency of reported hail damage and rising temperature over some parts of the world. But we need more scientific research to understand how the occurrence and intensity of hailstorms will change over India in the future with rising temperature.